Adding ancillary benefits can impact retention in your medical business, delivering value that can far outweigh the revenue they generate on their own. However, understanding exactly where, when and how to add ancillary products to your medical book of business is critical for success. 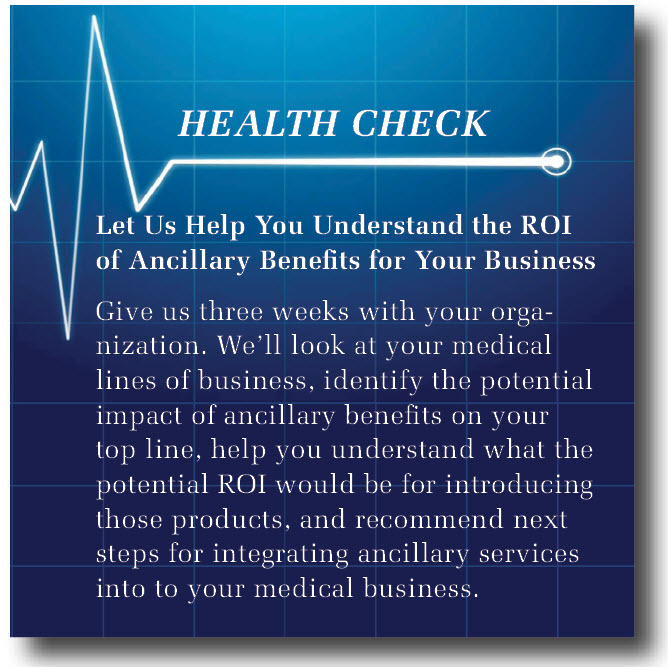 At Nolan, we have the modeling and analytical tools to help you quickly understand how introducing ancillary benefits will impact the persistency of your medical business. These tools will enable you to quickly understand the potential impact of specific ancillary benefits on retention in your medical business, and how it affects your top and bottom line. Build an in-depth profile of your book of medical business. Integrate your product and enrollment data with our industry data to create a model that helps you understand how adding ancillary benefits will impact your top and bottom line. Clarify which of your medical products to start with, which ancillary benefits to add first, and which sales channels are most appropriate. Develop a strategic roadmap to identify the best path forward for integrating ancillary benefits into your business. Create a defined operational model required for integrating ancillary benefits into your organization. Identify the ideal “build/buy or partner” scenario for ancillary benefits specific to your organization’s needs. Health insurers, their specific products, and the needs of their members are unique. We know that not all ancillary benefits marry well with all medical products. And we know that uptake rates and penetration of ancillary benefits across medical products can vary widely. Minimizing disruption to your organization and your members, increasing the likelihood of success, and driving revenue for your organization as quickly as possible are important in order to succeed in today’s increasingly competitive health insurance marketplace. This is precisely what our approach enables you to do.